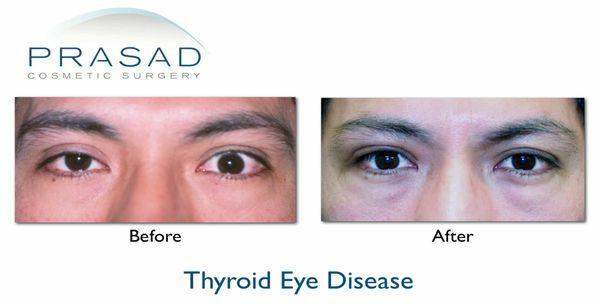 Thyroid eye disease, or thyroid-related immune orbitopathy (TRIO), is often characterized by the bulging of one or both eyes. This disease can also cause the eyelids to retract (pull away from the eyes) and also cause the eyes to become misaligned (crossed). This condition is also known as Graves’ disease. TRIO or Graves’ disease is caused by antibodies which affect your thyroid gland and at the same time cause muscles and fat behind the eye to become inflamed and push the eyes forward. Contrary to popular belief, the thyroid gland actually does not directly cause this inflammation of the fat and muscles around the eye. In some cases, inflammation can compress the optic nerve, causing vision loss. 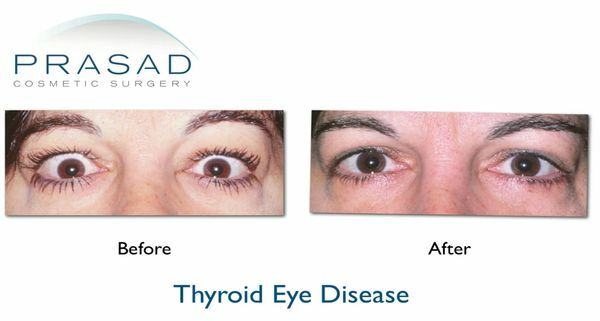 Thyroid eye disease/Graves’ Disease in middle aged female before and after corrective surgery to position right eye and right upper eyelid. The inflammatory stage is when the eyes change and appear large, push forward, and can also appear red. This is when the bulging of the eyes can cause lower eyelids to pull down (lower eyelid retraction) and upper eyelids to become too open (upper eyelid retraction). There are continuous changes to the eye during the inflammatory stage, which can last from 2-5 years. Male in late 30s in the inflammatory stage of thyroid eye disease in his left eye apparent from bulging. 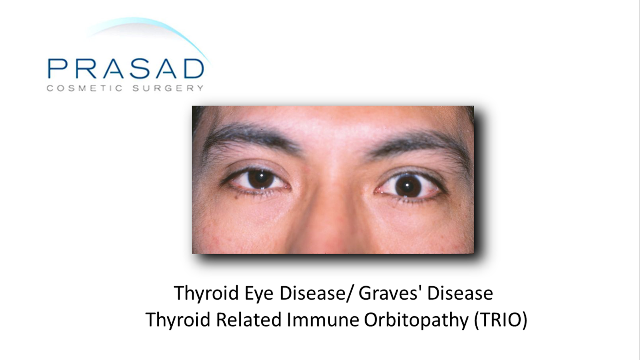 Female in early 40s with Graves’ disease in the inflammatory stage affecting both eyes causing them to be too open. While this is the stage where the eyes appear their worst, surgery is not usually performed since the eyes are continuously changing. In special situations where vision is being threatened, surgery such as orbital decompression is performed. Treatment during the inflammatory stage includes observation with no medical intervention, the use of steroids, and radiation therapy. Thyroid hormone levels are monitored by an endocrinologist. The thyroid hormone can be high (hyperthyroid), low (hypothyroid) or normal (euthyroid). In situations where the the thyroid hormone levels are high, thyroid suppression drugs as well as radioactive iodine (RAI) can be prescribed by the endocrinologist. The fibrotic stage is when the disease has stabilized from the constant changes of the inflammatory stage. Stability is determined by measuring the relative position of the eye called exophthalmometry and other ophthalmic measurements. In addition to examinations clinical photography is done to confirm the eyes’ stability in appearance. Once stability is confirmed, surgical correction of upper and lower eyelid retraction and repositioning of the eyeball can be planned. For some patients, surgical correction is not necessary as the eyes and eyelids can settle into a more natural position without medical intervention. Orbital decompression surgery is sometimes performed during the inflammatory stage to to prevent vision loss. This is due to the potential of swollen eye muscles and fat from thyroid eye disease to put pressure on the optic nerve causing vision loss. 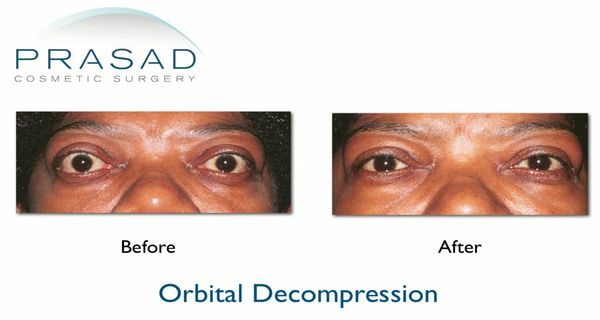 In such cases, orbital decompression surgery is performed to open up space in the bony area around the eye so the swollen fat and muscles have additional space to shift. This added space reduces the pressure on the optic nerve and allows the eye to be positioned further back in the orbit. 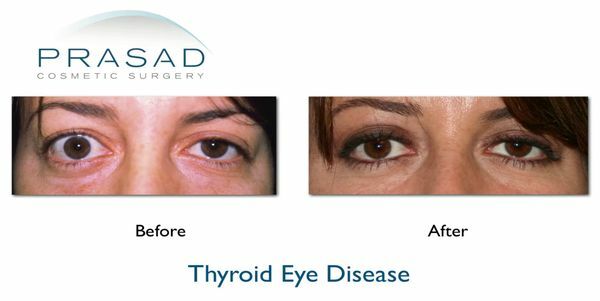 Lower eyelids being pulled down, and upper eyelids being pulled upwards so the eyes are too open are common signs of thyroid-related immune orbitopathy (TRIO). 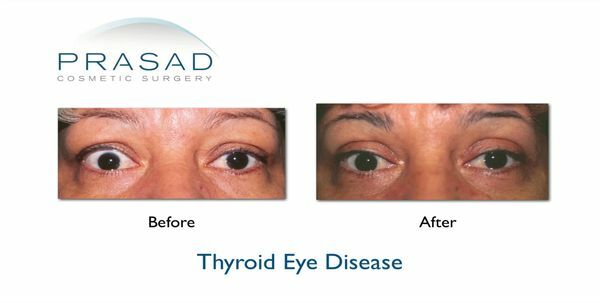 Woman suffering from Graves’ disease for about 2.5 years had her upper eyelids remain too open, so Dr. Prasad performed upper eyelid repair surgery to give her a healthy, natural appearance. Restoration of eyelid position of upper and lower eyelids can be performed with limited surgery such as Mueller’s muscle resection and levator muscle myotomy or recession. It can also involve grafting tissue to increase the length of the retracted tissue. Procedures can involve the grafting of skin, temporalis fascia, Enduragen, hard palate graft, and decellularized dermis. Stabilization of the eyelid structure can involve procedures such as lateral canthoplasty, canthopexy and drill hole canthopexy.